Fred Meyer has teamed with The Soulfull Project selling wholesome hot cereals. 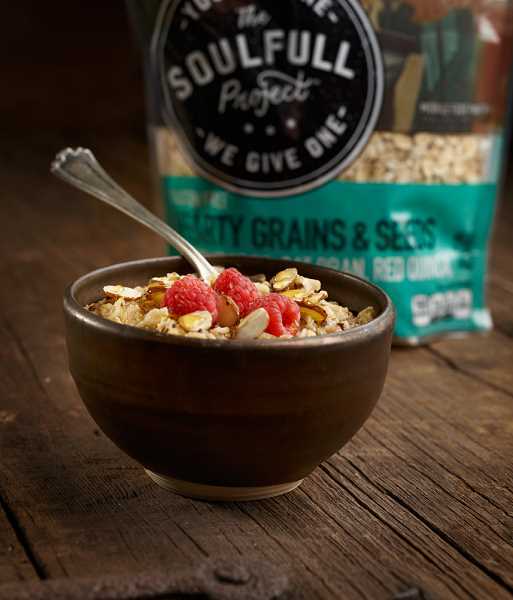 When consumers buy the product Soulfull Project donates cereals to the Oregon Food Bank. Oregon's food insecurity situation experienced a glimmer of hope last week, when The Soulfull Project — co-founded by Megan Shea and Chip Heim — launched its partnership with Fred Meyer Inc.
More than 12 percent of the U.S. population experiences food insecurity. To combat this, The Soulfull Project launched an innovative retail partnership with grocery stores nationwide. In Oregon they have partnered with Fred Meyer. For every serving of its nutrient-dense hot cereal sold at a regional Fred Meyer store, the company will donate a serving of wholesome hot cereal to the Oregon Food Bank. This mission-focused start-up is dedicated to making high-quality, nutritious food more accessible to those in need. Shea and Heim said the idea for the Soulfull Project came about from an unfulfilled promise they made a couple years ago. The two are employees of the Campbell's Soup Company and were in Texas meeting with families to learn about the food they eat. "We were on the way to visit the last family of the trip," reads the company website, thesoulfullproject.com. "When we turned onto the street we knew right away this was going to be a whole different experience. There were broken down cars, abandoned homes, barred windows, boarded up doors and graffiti everywhere. When we pulled up to the house, we hesitated. We didn't even want to get out of the car. Then someone said, 'We should go inside. You never know what we may learn." Upon entering the house they saw it was empty with the exception of a thread barren couch and an old TV. Sitting on the couch was a mother and her three kids. She told Shea and Heim she worked nights to keep her family's head above water. Shea and Heim were amazed when she showed them her kitchen — there was no food in the house. Not one can in the pantry, nothing. The woman said she struggled to teach her children to make good decisions about the food they eat, especially with so little money. "We saw and heard their struggles," the website continues. "We left their home, promising ourselves we would do something to help that family — more than offering just extra money and food. We had to do something bigger. We were so determined." Shea and Heim said they returned to their lives and did nothing until about a year later when working late one night in a warehouse there was a knock at the door. "It was a mother and her kids asking for extra food," the website reads. "Asking for dinner. As we handed them what little food we had, it reminded us. It reminded us about our broken promise to help that Texas family." That night The Soulfull Project was born. Luckily Campbell's Soup Company was able to launch The Soulfull Project as a wholly owned subsidiary. The company has developed nine products of good quality, non-GMO, clean labeled food with great taste. And they are making it available to everyone — regardless of social or economic status. The 4 Grain Hot Cereal was developed with the company's first giving partners to make sure they were donating high quality food that was needed by the partners. The cereal is an unsweetened blend of rye, oats, barley and toasted red quinoa in a resealable bag. More than 200 food banks will benefit from The Soulfull Project across the country. Donations generated through the sales at Fred Meyer will be donated to the 6 regional food banks in the Pacific Northwest and Alaska who service all of their communities. The products are easy to prepare: You simple add hot water and stir. Some are gluten free. "Food insecurity affects us all," said Heim. "And this is something we can all do to make a difference in every community in the nation." "There is a reason we used the word 'project' in the name," Shea said. "Ending food insecurity is a project and something we can help bring about." The cereals are already on the shelves at Fred Meyer. To learn more about the products and get recipes for using them visit soulfullproject.com.